Where Can I Use a Computer and Internet in Phoenix? Do you need access to the Internet or word processing programs -- whether for personal reasons or job searching -- but don't own a computer? You aren't alone. Unfortunately, it is now almost a requirement to have an email account and be computer savvy in order to apply for a job with many companies. Even more challenging for some people is the fact that wireless (Wi-Fi) access, offered at many coffee shops and restaurants, doesn't help if you don't own a computer. and a thousand other uses! 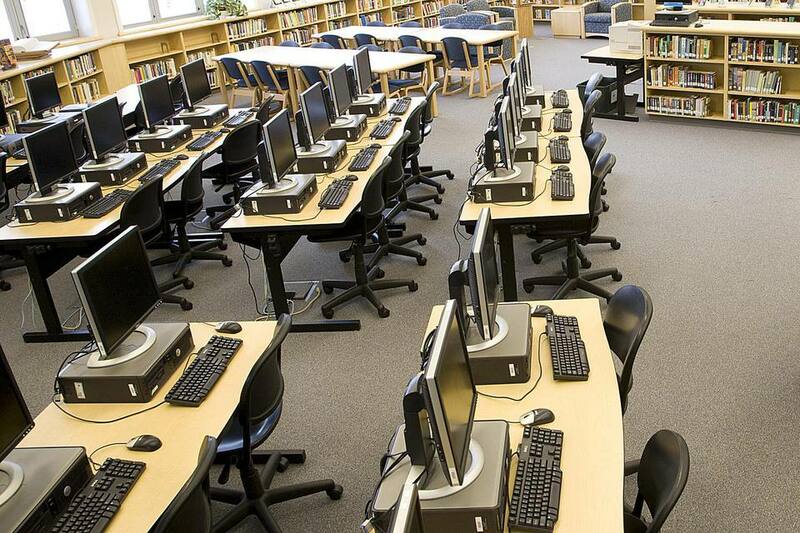 Various municipal and regional public libraries in the Phoenix area offer computer workstations aside from the computers that are dedicated to the library online catalog. Each library system has its own set of rules and filters that may limit exactly how you can use these computers. Generally, you must have a current library card with no amounts owing in order to access an Internet-enabled library computer. Maricopa County, Apache Junction, Avondale, Buckeye, Cave Creek, Chandler, Glendale, Mesa, Peoria, Phoenix, Scottsdale, Tempe and Wickenburg have public libraries. Some Phoenix Parks & Recreation Community and Recreation Centers have computer labs. Most recreation centers require you to have a recreation pass in order to use any of the facilities including the computer lab, and fees for that pass vary depending on whether you live in or outside the City of Phoenix. Vernell Coleman Recreation Center, 1003 South 9th Ave.
Bret Tarver Learning Center, 1516 N. 35th Ave.
Luke Krohn Recreation Center, 1940 ½ E. Villa St. If you don't live in Phoenix, or those locations are not convenient, check with the recreation facility in your city to see if there are computers available for public use. Senior Centers in Greater Phoenix -- Scottsdale, Glendale, Chandler, Fountain Hills, Tempe and maybe others -- offer computer labs and classes. Some don't require you to be a senior, some may have a small annual charge for use of the computers, some have limited hours. Check with the senior center in your community to see if they have computers for public use and what the requirements are. These Career Centers are equipped with computers, printers, Internet access, telephones, and fax machines at no cost to the community. The computers are primarily meant to be used for job banks, resume design, and employment research. Goodwill has career centers in Apache Trail, Central Phoenix, Phoenix Mountain Campus, Northeast Phoenix, Northwest Phoenix, Tempe, Chandler, Peoria, Yuma, and Goodyear. The Resource Centers at each Career Center offer job postings, word processing, resume software, Internet access, and office equipment, including a fax machine and a copier. There are comprehensive sites in north and west Phoenix as well as an affiliate site in south Phoenix. Operated by the Maricopa County Workforce Development Division, which is part of the Human Services Department, the centers provide public access to computers, fax machines, and copiers for purposes related to job searching. The resource room at the Westside Workforce Development Center offers its customers access to the Internet, job openings, job fair information, resume writing assistance, a fax machine, and telephone. The organization offers computer access, job search resources, a fax machine, and a local phone. The organization asks that you attend an hour-long orientation workshop and sign up for one of its programs. It has locations in Central Phoenix, East Phoenix, West Phoenix, North Central Phoenix, Chandler/Gilbert, and Yavapai County. Your local Maricopa Community College may have public hours for computer usage. If you receive services from a local nonprofit or government agency, ask if there is availability for computer usage as part of their program. Do you know of another place where people can borrow a computer and get Internet access for either no charge or for a small fee? Let me know about it, so I can include it here. All dates, times, prices and offerings are subject to change without notice. Get Trained, Get a Career. Free Training in Phoenix, AZ. I Have a Gun. Can I Carry It? You'd Be Amazed at What You Can Do at Your Public Library! How Far is It Driving From Glendale, Arizona to ...? Where Is the East Valley and West Valley in the Phoenix Metro Area? How Long Is the Drive From Carefree To Other Arizona Cities?